Minutes after Malaysia Flight 370 disappeared from military radar in the early morning hours of March 8, the airplane experienced a total loss of power but recovered, according to information released by the Australian Transport Safety Bureau. 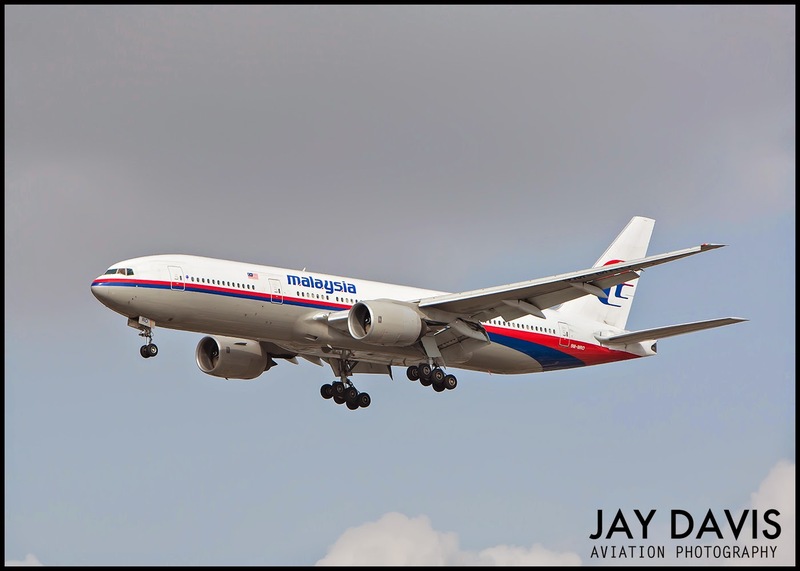 The Boeing 777 last seen by a primary radar return at 2:22am (Malaysia time) headed north west along the Malacca Strait, was still flying in that direction when the power loss occurred. Three minutes later the airplane sent a log-on request to the inmarsat satellite network, meaning its energy supply was back up and running. The team of experts from the UK, US, Boeing, inmarsat and Thales, who have been studying the scant data associated with airplane's disappearance have concluded the most likely cause was an interruption in power to the SDU. Whatever its cause, by 2:26am, the problem had resolved itself to the extent that the airliner's in flight entertainment system requested to go back online. Passengers may appreciate movies and games, but IFE is not considered essential by any means. Still, I am told it is given a certain priority in the lengthy list of items supplied by the aircraft's electrical system. This loss of power came at an intriguing time in the so-far incomprehensible story of the Kuala Lumpur to Beijing flight gone terribly awry, because it occurs within minutes of the plane's last known position over the water; north of Sumatra west of Thailand at its border with Malaysia. (E96.5 N6.5 on the report's graphic) At that time the plane was heading northwest. How the plane came to do a rough 200+ degree turn and fly south is not known. Nor for that matter is it known when the plane did the turn. Based on my reading of the inmarsat pings and the computer-assisted probability formulas run by the search team and explained in the report, the window is expansive. It places the last "large" change to the aircraft's track no more specifically than happening before 3:15 am (Malaysia time) and that could mean as long as fifty minutes after the power interruption. This is not to say that the turn didn't happen before then, only that from 3:15 until the plane ran out of fuel five hours later, there's nothing on which to rely for that information. All of which shows how complex the calculations must be for figuring where that plane ended up in the impossibly large Indian Ocean. What I find intriguing is that this anomaly - hey let's call it a problem - is that it is a previously undisclosed clue about what caused this plane to veer off its track and go missing and I am not alone in thinking this could be a BIG DEAL. Talking to a experienced Boeing 777 pilot about a loss of aircraft power an hour and a half into the flight, he agreed, "That's not a subtle thing, it's not subtle at all," especially considering the possibility that the power interruption could be associated with the plane's new course to the south. I received the ATSB's 58 page report on Thursday, but filled as it is with complex explanations and assorted graphs and formulas, it has taken me several readings to get the general gist. This is what prompts me to take another look at my earlier post reporting that the plane may have made a dramatic spiral descent into the sea. While I based this on my interview with Martin Dolan, chief commissioner of the safety bureau and his assessment of what would happen in an asymmetrical loss of engine power due to fuel exhaustion, pilots who fly the 777 suggest even as fuel runs out on each engine separately, other mechanisms are designed to keep the plane on a wings level glide. MH 370 probably did not careen wildly into the ocean, they say. "Generators that are hardwired into the airplane" will compensate for the loss of thrust if one engine quits before the second, I am told. These are "permanent magnet generators. If the engines are turning, just windmilling power is getting to the flight controls." The difference between slamming abruptly into the sea versus a more stable plane-provided glide is significant. The glide, estimated at 100 nautical miles by the ATSB creates an "impractically large search area," while a spiral descent narrows the range to 20 miles from the point of fuel exhaustion. 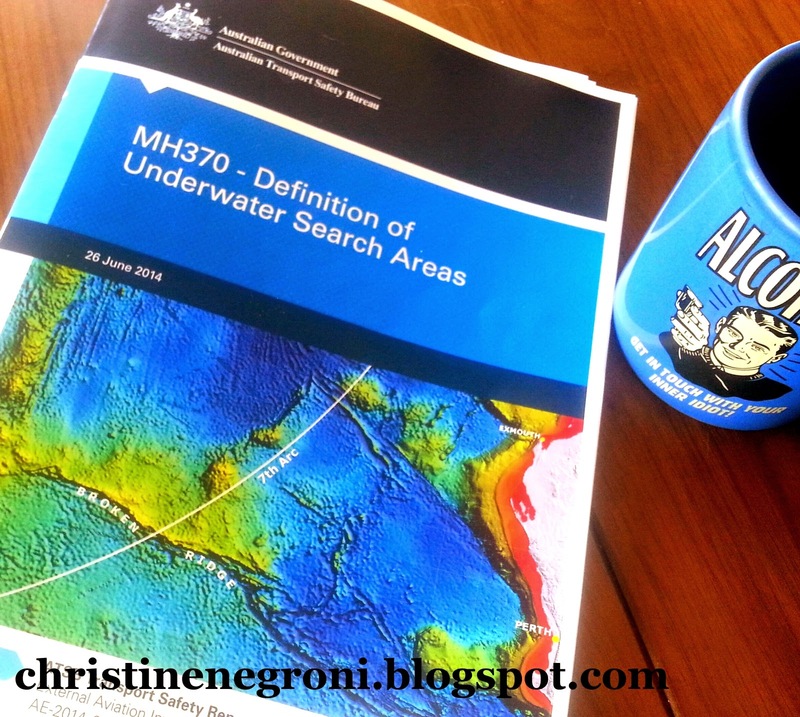 Given the ATSB's commitment to search sixty-thousand square kilometers in the next year, practicality rather than most-likely scenario seems to have ruled in terms of where to start searching when the hunt for MH 370 resumes in August. Once again, however, I'm staggered by how the slimmest of leads can blossom and it gives me hope that sooner or later, the full story of MH 370 will be known. This is good stuff you're on to. Check for weather or other anomalies where it happened. It is possible that the plane encountered a gust or bad weather. OK.. get me a 777 fuel systems engineer. Tell me about fuel tanks. If one of the tanks is suddenly empty, does it automatically cause software to switch to another tank if the warnings are ignored. What could have caused this thing (speculating now) is the tank it is drawing on went dry, and either one or the other engine had a power surge. If the engine shut down completely from lack of fuel, is there a software controlled automatic restart? Or can it only be a momentary glitch but not an actual restart? Is it possible for one engine to have quit but the plane to continue to run on only one engine if there is no automatic restart? Whats more.... suppose there is no longer a course programmed in the autopilot. When the system reboots, what course would it follow? David Gleave, "an aviation safety expert from Loughborough University"
"A person could be messing around in the cockpit which would lead to a power interruption," he said. "It could be a deliberate act to switch off both engines for some time. By messing about within the cockpit you could switch off the power temporarily and switch it on again when you need the other systems to fly the aeroplane." This so called "expert" have no facts on which to base the claim. Wouldn't it be simpler and more obvious that there was a fuel interruption because the tank that the flight was flying on 90 minutes into the flight just ran out of fuel? Let's rule out that possibility first by asking what do the 777 that have a highly sophisticated set of automation routines do when the plane run out of fuel on one tank and the crew do not respond to warnings and manually switch the fuel feed to a tank that has fuel. 2 tanks in wing, 1 center tank. There should be a record of how much fuel was on board, and at least some indication of how much was in each tank. Working backwards, one can figure out whether the crew decided to burn off fuel in what order. 90 minutes into flight with a power interruption possibly caused by a fuel tank running dry would suggest one of the smaller tanks ran dry. Was it the smaller rear tanks (if equipped)? It would make sense to run those tanks dry first. How the aircraft would behave if the tank ran dry and there is no pilot to command switching to another tank is an empirically verifiable question. "Experts" should have asked that first before jumping to conclusions. Or turn in their "expert" badge. To be clear readers, this first power interruption could not have been caused by fuel exhaustion as it was just 2 hours into the flight. The second power loss was concluded to be from the end of fuel; the log on attempt was not complete probably due to the plane's termination in the sea. See previous post on this, including discussion of the rat deployment. "The report also notes that the plane's in-flight entertainment system delivered a satellite message 90 seconds after the first power failure but not after the second failure hours later. This, it says, "could indicate a complete loss of generated electrical power shortly after the seventh handshake"." This suggest a partial failure, a gulp or engine sputtering from fuel starvation, but the automation switched fuel tanks fast enough to either keep both or at least one engine running. "Another aviation expert, Peter Marosszeky, from the University of New South Wales, agreed, saying the power interruption must have been intended by someone on board. He said the interruption would not have caused an entire power failure but would have involved a "conscious" attempt to remove power from selected systems on the plane. "It would have to be a deliberate act of turning power off on certain systems on the aeroplane," he said. "The aircraft has so many backup systems. Any form of power interruption is always backed up by another system. "The person doing it would have to know what they are doing. It would have to be a deliberate act to hijack or sabotage the aircraft." This so called "expert" did not consider the rather obvious lead: What do the 777 automation and backup do when there is no response from the crew to warnings of fuel starvation / empty tank and there is fuel in other fuel tanks? With Australian "experts" like this, who apparently did not consult with Boeing or any experts familiar with the architecture and engineering of the 777's flight control software failsafes before they offered their "expert" opinion, who need inept Malaysian and Chinese investigators? Australian "experts" quoted are sounding more and more like Daily Mail "experts". The first power glitch is not from running out of fuel on board, but can be from one tank running dry. I'm confused, though. What does "total power loss" mean, exactly? Which buses and which systems? Both generators? Both generators * and * standby power? There's also a backup hydraulic generator on the 777, I believe (similar to the one on the 767 that I fly). "Another aviation expert, Peter Marosszeky, from the University of New South Wales, agreed, saying the power interruption must have been intended by someone on board. He said the interruption would not have caused an entire power failure but would have involved a "conscious" attempt to remove power from selected systems on the plane." How the HELL could a supposed "aviation expert" actually say such a thing? On the 777 or modern aircraft, the software decides what to do when there is a power glitch or failure. In the event of a total failure (nothing at all), a Ram Air Turbine (RAT) deploy that generates emergency power to keep the absolute minimum of things running (a few instruments, flight computer, certain comms link). The question you appear to be asking is, whether there an interval where certain systems will be completely shut down (e.g. not even battery backup). Need a 777 engineer to speak to this, but I assume that any not absolutely essential system such as ACARs will not be battery backed up for normal operations, but the flight computer might be for at least long enough for the RAT to generate enough. Almost everything else that draw a lot of power would probably go down and then have to reboot / restart. If there is just a partial power failure or glitch (e.g. one engine out), then there is an orderly power down of non essential gear such as passenger cabin entertainment systems that are very low priority, and with the flight control systems right up there. The rationing of power is determined automatically by the software, though the crew can override some of it, e.g. by pulling fuses or with software controls. I understand the ACARs system (satcom link to Imarsat) is very hard to disable as it is wired in at a pretty high level of priority, and it also do not draw much power. There was a previous discussion somewhere that says to disable ACARs need access to the fuses or instrument bay that is accessed by a hatch from the cockpit. In other words, not easy to do. Speculation, experts opinions and some hoping for fame and praise writing their own theory. The hype is disrespectful and just so Hollywood. A historical investigation of the airline such as audits, maintenance, fuel and so on takes time. The search...who knows? Do you? No. Near five years after surviving a jet ditch in the ocean, still no further with the truth of the investigation, yet. The facts were there, just hidden. Although all are desperate to find the truth, speculation and assumption is not the answer. Nor are the opinions to sell or increase ones own glory. Respect for those on board, please. Be patient, wait for facts and for goodness sake, stop making a circus of theories. Blogs on personal "experts" websites creating multiple assumptions when all is not known, typical of the "Look at me Syndrome". With all the variable hypothesis circulating, with no real hard evidence to date, my thoughts go to the people and families. They will be reading all these blogs and it will mess with their minds. This I know as I have experienced this. Enough until facts and truths are known. If anything, create a blog for them offering kind words. Doesn't take long for the human caring element to disappear when there is a story to be told that is of uncertainty and intrigue by those who weren't there. My flight ditched in the ocean at night and I was certain we would perish. That they felt the peace I did. An acceptance of passing was an acceptance of life. I hope in some small way this is comfort to the families. It will take time to investigate and people will theorise. Cherish your memories, be patient and don't let the investigative process dominate your life. If I had perished on November 18, 2009, it would have been my wish to my family to accept, be patient and to keep the love I gave alive. Rather than trying to reason from incomplete evidence, show compassion to the people who have lost someone. This is what I have learned. The unfounded, unprofessional speculations as to the cause of the ACARS system rebooting the first time is now all over the internet. The Telegraph story was picked up by many other different outlets, with no fact checking or validation of the sources. It is understandable how upset the families and next of kin of the victims of MH 370 must be to see this kind of "news" by disreputable, shameless hucksters who call themselves "experts" pontificating on things that they in fact have no fact based knowledge of. Suppose the plane begin to run short of fuel from one of the tanks. Suppose only one of the engines "died" or had a severe loss of power. Suppose there is no conscious pilot or person at the controls. Would the plane then turn because of uneven thrust? What is the software programming for fail safe when warnings of fuel tank running dry is ignored? Do the software eventually automatically switch the fuel to tanks with available fuel? If the engine(s) that "stalled" suddenly got fuel again, does it need to go through the restart procedure or will resumption of fuel flow mean it just fire up as if nothing happened? Such as the 200 degree turn --- if one engine flamed out first, resulting in uneven thrust. Resumption of fuel flow... and the plane goes back to normal. Boeing... your input is needed. In my thoughts about MH_370, I am constantly reflecting back to Swissair flight 111. A similar on board fire within the walls of the MH 370 aircraft or in the electronics bay could explain just about every anomaly that took place on board the missing Boeing 777; including the failure of the transponder as well as the crew's lack of radio communication. Perhaps, the crew of MH 370 were able to successfully fight a fire and extinguish it; but not before it had already wreaked havoc on the aircraft systems. Although to do so in the open ocean is much riskier than in a river, it is even possible that the pilots of MH 370 were able to successfully bring the airliner down to a safe water ditching a-la Captain Sulley and US Airways Flight 1549 only to have the aircraft slowly sink into the ocean leaving little or no debris and no survivors. Thank you, Christine, for your diligent and responsible reporting, as always. I look forward to reading your new book! Difference with the Swissair flight is that 777 is highly automated, and it almost practically flies itself without any pilot input. An explosive decompression is not enough of a cause, though it is possible for a fire in the electronics bay to be so intense that it would incapacitate the crew before they can get access to oxygen masks. The electronics bay fire theory have to deal with how does it work that the plane can keep flying if most of its electronics (which include the flight control computers) are knocked out? And why did the fire not spread resulting in a catastrophic crash? What could have put it out but yet not give the crew the opportunity to don masks and issue a distress call or take other action? Many unanswered questions using the Swissair example. For those who think it was crew suicide / passenger attack there is a precedent, which is Federal Express Flight 705 which was stopped by the flight crew despite the attacker gaining access to the cockpit and seriously injuring the crew. Shouldn't the Egyptair fire be re-investigated and cockpit oxygen systems all checked again to see if something was missed? There is still no official word as to whether MH 370 received the oxygen hose fix that came out of that AWD. US regulators are intending to order Boeing 787-8 operators to replace cockpit oxygen hoses to limit the risk of a fire similar to that which destroyed an EgyptAir 777-200. Under the proposed directive the low-pressure crew oxygen hoses will be replaced by hoses with non-conductive internal springs. Anonymous, you seem to have missed my point in mentioning Swissair flight 111. I am not sure how you came up with the idea that my theory about MH-370 uses Swissair 111 as an example to imply that the same sort of catastrophic fire took place on the Malaysian aircraft. Although I commented that MH-370 causes me to reflect upon the Swissair MD-11, the theory I presented regarding MH-370 clearly involves a completely different kind of fire than that which occurred on flight 111. I am not sure why you directed your comments, questions and analysis towards me because the points you made in your reply have nothing to do with my theory as presented. In your response to my post, you replaced the smaller, controllable fire in my theory with a raging conflagration so intense that it would have incapacitated the pilots before they could get their O2 masks on and then subsequently destroy most of the critical flight control systems. Therefore, your comments and questions are rooted in an entirely different situation that has little resemblance to the one I presented in my post. You ask, "And why did the fire not spread resulting in a catastrophic crash?" As I mentioned, my theory leans itself towards the possibility of a smaller, more controllable fire that the crew was able to get control of and extinguish before it could bring the plane down. In my post, I also suggested that a smaller, containable fire could have wreaked havoc on various systems while leaving others intact and functioning. You went on to ask, "What could have put it out but yet not give the crew the opportunity to don masks and issue a distress call or take other action?" The scenario in this question is well outside of the theory I presented. Again, it tosses out the subject of a small fire that the crew were able to get extinguished and replaces it with a raging conflagration like the one that destroyed Swissair 111. The theory I presented never used Swissair flight 111 as an example beyond the idea of a fire on board. Any comparison with MH-370 in my theory ends there. Taken at face value, my theory does not leave the many unanswered questions that you claim. I would venture to suggest it is more likely that your reading comprehension is responsible for creating that confusion. It is not a far fetched idea that the aircraft could have been damaged by fire as to cause some loss of control and that the pilots could have eventually regained enough control to be able to guide the aircraft down and successfully ditch in the ocean, which would leave virtually no debris. And finally, there are some who would consider the MD-11 to be a "highly automated aircraft that practically flies itself without any pilot input." Even a Boeing 737 can do that.